Walls have become a hot topic issue with the upcoming election, but love them or hate them, Republican or Democrat, could we all just come together and agree that colorful, creative walls are awesome? I have been on somewhat of a quest as of late to find some fun walls to take pictures by in and around Los Angeles. 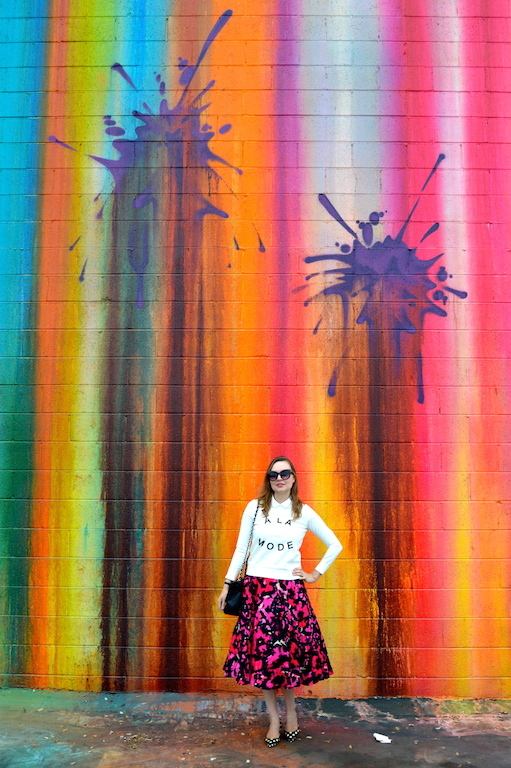 It might sound insane, which it kind of is, but it has given me a fun excuse to get out and explore different areas and communities in Southern California, so for that reason alone, I say colorful walls are okay by me! This rainbow one is located in Pasadena by an art school. Unbeknownst to me, said art school has two campuses in Pasadena, and my husband and I went to the wrong one. On the bright side, though, it was a beautiful, scenic ride there and back. So again, it was very much worth the time and effort! Oh and the wall is beautiful and yuge...I mean huge! What a fantastic spot for photos! You really do seem to manage to find the best photoshoot locations. I love your colorful wall quest! 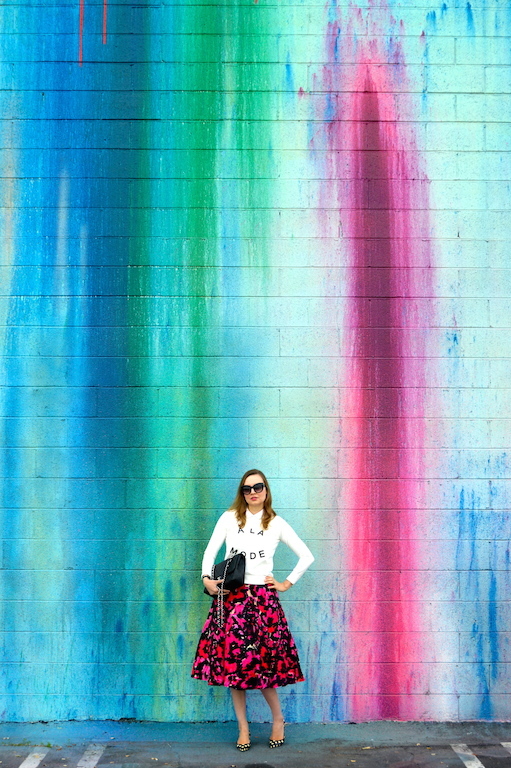 Your pretty skirt coordinates with the wall so perfectly too! You always find the best backgrounds--you're really inspiring me to want to get out of my yard (or in front of my garage...yawn) and find some great locations! Loving this look! Gorgeous skirt! Love the beautiful wall! I love the print on the skirt. It's so fun. That wall is a fabulous backdrop! It looks great with the bright skirt and I love the polka dot shoes with it! Adore this look! What an awesome wall. Your outfit is so adorable too! Such a great ensemble, my favourite outfit from you lately! Gorgeous skirt!! Perfect against the colourful backdrop. I love the locations you find for your photos. They're half of the fun. That skirt is adorable!